The leash with all the bells and whistles. Standard 6' feet of upcycled rope with unique features that make it multi-functional. Anchor around a tree or any fixed object for a safe place to secure your dog while on the go or out adventuring. Out on a run, coffee shops, hiking, music festivals, frisbee in the park, take your dog with you anywhere with the security and functionaltiy of this leash. Additionally, the leash can shorten from 6 feet to 1.5 feet and comes with a sliding handle for full-body or head control while on the go. This lead was inspired and designed from various rock climbing applications. The Ruff-Guider in its purest form comes with 2 professional C.A.M.P. carabiners ( a 1.7 oz black or silver locking carabiner for the collar attachment and a 0.8 oz nano sized carabiner on the handle). Customers need to play around with the leash, and within minutes that will discover many uses not mentioned. Same as the original Ruff-Guider but uses a traditional swivel bolt clip as the collar attachement instead of a locking carabiner. The leash with all the bells and whistles. Standard 6' feet of upcycled rope with unique features that make it multi-functional. Anchor around a tree or any fixed object for a safe place to secure your dog while on the go or out adventuring. Out on a run, coffee shops, hiking, music fetivals, frisbee in the park, take your dog with you anywhere with the security and functionaltiy of this leash. Additionally, the leash can shorten from 6 feet to 1.5 feet and comes with a sliding handle for full-body or head control while on the go. This lead was inspired and designed from various rock climbing applications. The Ruff-Guider in its purest form comes with 2 professional C.A.M.P. carabiners ( a 1.7 oz black or silver locking carabiner for the collar attachment and a 0.8 oz nano sized carabiner on the handle). The classic and traditional leash for most dog owners. This leash comes in 6ft of length, but varies in rope design and color. All ropes used to make the MTN Line are 100% upcycled and come with an a small orange or blue rope clip link on the handle so the leash can be worn around your shoudler. The collar attachement is a Stainless Steel bolt snap that swivels allowing for a tangle free walk. This is the mini-version of our Standard MTN Line leash. This leash is for dogs 20lbs or less, or for someone that wants a very light-weight leash. The rope used for the mini is much skinner (thinner diameter) and is suggested for dogs that migth get carried away by predatory birds. Again, this is a classic and traditional leash for most dog owners. This leash comes in 6ft of length, but varies in rope design and color. All ropes used to make the MTN Line are 100% upcycled and come with an a small orange or blue rope clip link on the handle so the leash can be worn around your shoudler. The collar attachement is a Stainless Steel bolt snap that swivels allowing for a tangle free walk. Even BIG dogs could use this leash as it is just as "strong" as a normal MTN Line. A once custom designed lead for a Buffalo, NY dog running company has now turned into a best-seller leash for our dog runners. 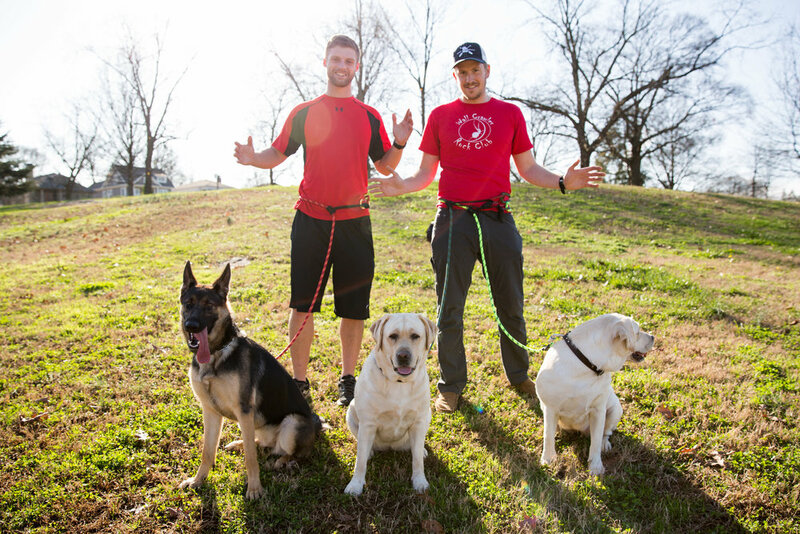 The Dash Dog Leash is designed to be worn around the runner’s waist for better leverage and a lower center of gravity. But this isn’t a “hand-free” leash, because we also included an adjustable handle so we have two ways to control the dog. The handle is a Prusik knot, which easily slides up and down the leash – but when tension is applied (dog pulling), it locks down. With this nifty handle, we can instantly rein a dog in closer or give it extra room to romp. When it comes to attaching the leash to the dog, we need flexibility for everything from a Pomeranian to an Italian Mastiff. That’s why we designed the Dash Dog Leash to be reversible. On one end is a locking CAMP carabiner, which gives us maximum security for larger dogs. In the event that the carabiner is too bulky, we can flip the leash around and use the high-quality, Scuba-rated bolt clip. In either direction, we have the ability to attach an orange safety line so we’re attached to the dog at two points. The Tugachuk is a revolutionary up-cycled climbing rope dog toy we are very proud of. It utilizes 100% up-cycled materials including tennis balls that have either been donated from local tennis organizations, or hand collected and removed from various creek and forest ecosystems around Atlanta, GA. 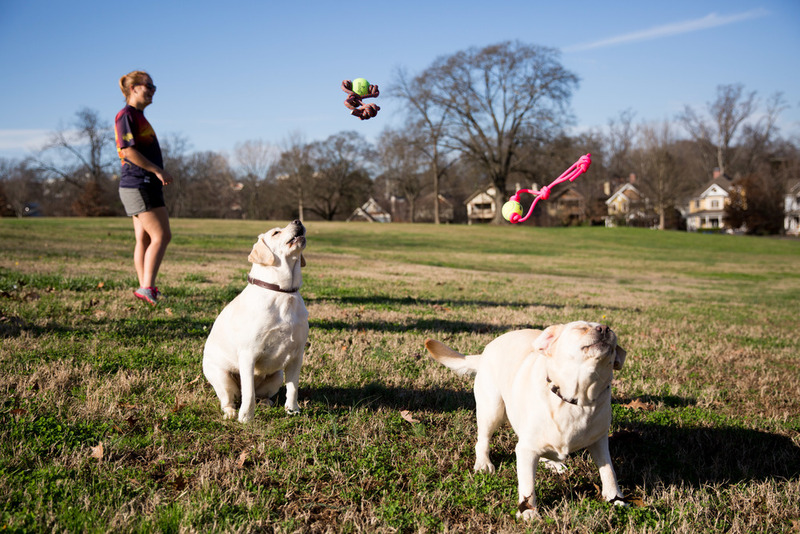 The Tugachuk™ is perfect for tugging with your dog with its durability and its comfortable grip for the hand. It also incorporates resistance knots on the edge of the tennis ball to protect the ball from being chewed off. So get outdoors, tug it, and then chuck it as far you can in the park, the woods, or even at the lake (it's great for water retrieval). Please tell customers that it should only be used as a SUPERVIZED toy. It should never be left with the pet unsupervized because of eating and choking hazard.